Detached Chain Stitch can be worked with 2 needles to make a 2 coloured stitch, thread one needle with the loop colour and one needle with the seal down stitch colour…When stitched with silk ribbon the 2 coloured Detached Chain Stitch looks like rose buds. With a few small adaptations the Butterflies that I showed you the other night Dragon Fly…Use straight stitches to Stitch a small tappered body, place Detached Chain Stitch wings either side and add 2 French Knot eyes…I used a metalic thread for the wings so that it would shine like dragonfly wings do. Stem Stitch done with 2 strands of varigated cotton floss. 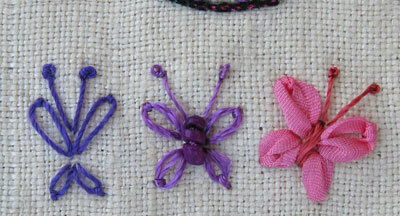 Detached Chain Stitches makes lovely butterflies. The first time I encountered these butterflies was on the cover of Dorothy Bonds book Crazy Quilt Stitches (ISBN 0-9606086-0-5) which look much like the first purple butterfly which is done with silk buttonhole twist thread. I tend to leave a gap between the wings so that I can add a stitched or beaded body…the second butterfly is stitched with Rayon Thread and has a beaded body. 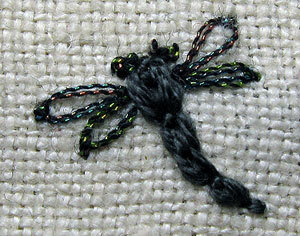 The 3rd butterfly is stitched with Silk Ribbon and has a stitched body…Silk Ribbon makes a lovely full winged butterfly. 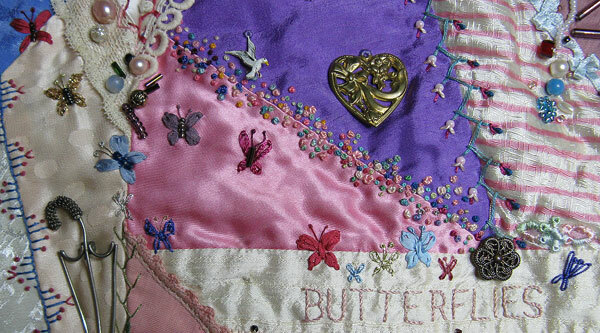 Below is a flight of Butterflies on a detail from my crazy quilt called Butterflies. 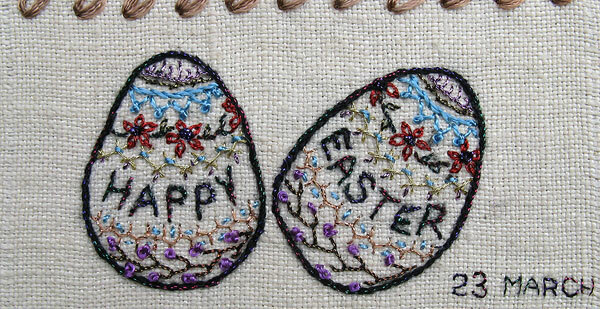 To decorate my sampler eggs I have done rows of embroidery stitches making them miniature samplers…Because Easter Eggs are wrapped in bright, shiny foil I have used shiny threads for the stitching on the eggs and all the threads are metalics or rayon. 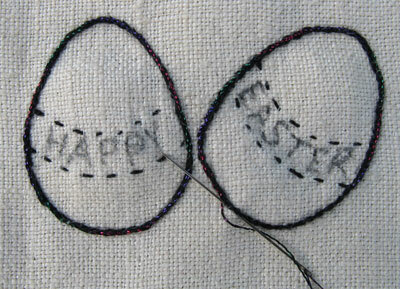 Now that Easter is over I have got time to record Easter on my Sampler or st least get it started…I started by drawing 2 eggs and outlineing them in black stem stitch, the black looked to severe so I overstitched it with a fine varigated matalic thread which has softened the edges. 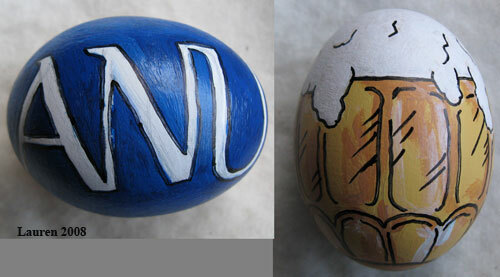 These are our 2008 Painted Easter Eggs and below are detailed images of a few of them. 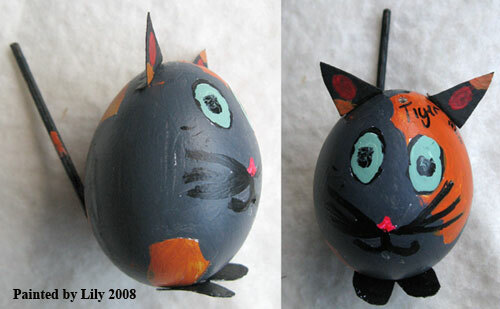 Lily used her cat, Tiger, as inspiration for this egg, In past years I have given her assistance cutting and glueing the ears and extra bits to her eggs, this year age 11 she did the entire thing herself. 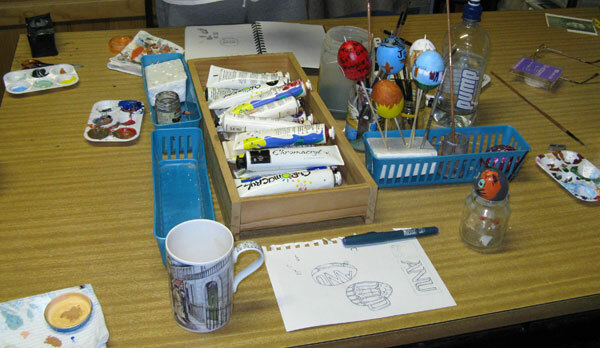 I love the cat’s tail, it is a piece of one of the skewers that we put the eggs on when painting them. Lauren has used her life at uni for her inspiration dividing her egg into halves, one half for the series study at the Australian National University, the other half for the social life. 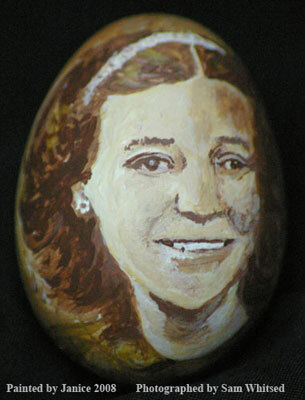 For her inspiration my sister used the same image of our mum that I used on mum’s memory quilt, under the Mango tree. I also used mum’s memory quilt for inspiration (and continued a theme that has run through my work)…I Painted a cloths line on my egg…I put a post on either side of the egg and ran a line around each side, when I saw the magnified image I could see that it is not very well painted but at egg size it looks good…When you can hold the egg and spin it the design works well but it is the hardest yet to photograph. Well I have taken Photos of our painted Easter eggs and have them ready to upload but every time I try and upload them I am getting an error message, that I don’t understand…I will try again in the morning and fingers crossed that it will fix itself overnight. 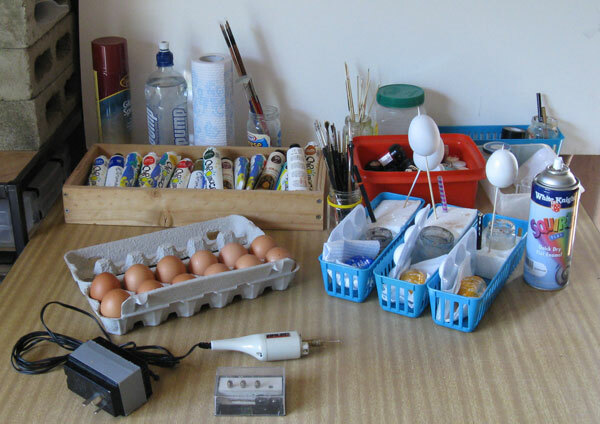 We have had a lovely afternoon painting eggs…I will wait till tomorrow, when I will have daylight, to take photos of the eggs. 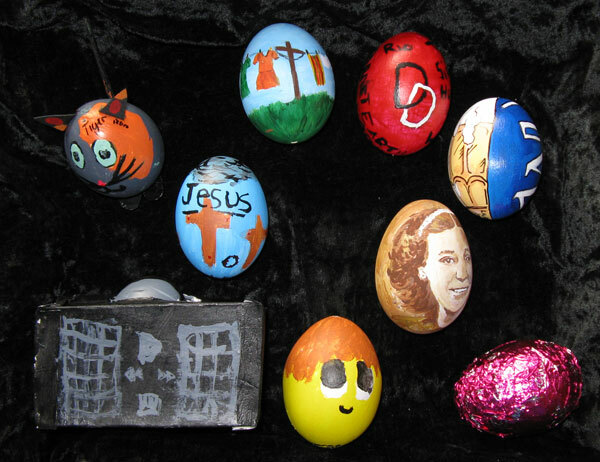 It has become tradition for the Canberra branch of the family to paint eggs at easter..The following links explain how the the tradition got started, the eggs we have painted in past years and other eggy stories. I am not quite as organized this year as I was last year and still have to blow and undercoat more eggs but everything else is ready to go.